3. And for the other 22,000 students, the government will be subsidising only 25% of the fess. According to government this subsidies will cost the state rs 140m to 150m, and the financing will be taken out of the budget of the MTPA. In the meantime, some 5,000 Ã 6 000 persons have been at the marche de protestation, yesterday afternoon at Centre-de-Flacq, the electoral district of Minister Gokhool, organised by the Plate-forme nationale. Paul BÃ©renger, in his speech, said that the 25% subsidies is a forward step but nonetheless insufficient. He continued stating that Gokhool is not worth minister of education. There has been reported aggression against two students at the end of the march. A pacific manifestation was held today against the Gokhool reform of abolishing the subsidies on SC and HSC fees. The march started from bus station of Rose Hill to end at Plaza hall. 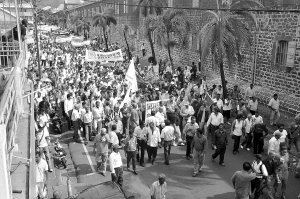 There were amongst the marchers, students from various colleges around the island, concerned about the reform, and some politicians gathered around a theme “plateform nationale:ran nu 50 % subside”. According to le Mauricien, the meeting gathered some one thousand marchers and prostesters. This is the second time a student manifestation is going to be held, while the government is still holding on to its reform. Earlier, during the flag raising ceremony at a private secondary school in Rose Hill, some students have silently left the college hall while the Minister of Education was pronouncing his speech on reforms and responsibilities of each stake holder.